How Backrack™ Treats The Causes and Symptoms of Back Pain? Home / HOW DOES IT WORK? There are many things that can go wrong with the spine but, in essence, up to 98% of all back pain is either caused by, or directly linked to, compression, the term used to describe the spine when it becomes squashed or shortened from its natural length. If we can decompress the spine (something which the backrack™ does) we can treat the causes, and hence the symptoms, of back pain. As can be seen from the next diagram, the backrack™ mirrors the natural curvature of the spine. As a result, the back is fully supported: it rests in a neutral position.The wooden nodules push up, on either side of the spine. 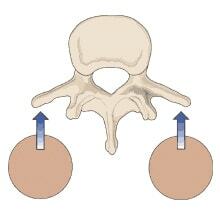 In turn, this lifts the individual vertebrae (as shown), causing them to pivot about the joints in the back. As a result of this, the joints are decompressed, and the spine lengthens. Joint mobility (and soft-tissue elasticity) increases. Stiffness and back pain are therefore reduced. Inaddition to this, the pressure on the joints and the intervertebral discs is lowered. This lowers the risk of spinal Osteoarthritis and Bulging or Herniated discs. Finally, the pressure on the spinal nerves is reduced: this will treat symptoms such as acute local pain, Sciatica and Pins and Needles. This is very important: the Backrack is designed to remove any unwanted stress on the spine. It will also apply stress that is wanted. The Backrack treats the causes (and hence the symptoms) of back pain. The spine is decompressed, reversing the effects of gravity (as well as injury, bad posture, and old age). If you would like to know more about how the Backrack works, please read our Advanced Explanation.Full details for use of the backrack™ are contained in our Instruction Manual (PDF document).PDFs are exact copies of printed documents. To view this document, you will need Adobe’s Acrobat Reader installed on your computer. You can download this for free from Adobe’s website. In the How does it work section, we explained (briefly) how the backrack works. To explain this in detail, however, we must first describe the structure of the human spine and the main, underlying cause of back pain. From this, the design principles of the backrack™ will become clear. The human spine consists of a number of vertebrae, or units of bone, arranged in a vertical structure. A structure known as the spinal column. In new-born children, the column comprises 33 distinct, or physically separate, vertebrae. Over time, however, the units at the base of the column fuse together to form the coccyx, or “tailbone”, and the sacrum, which forms part of the pelvis. The mechanical function of the spine is two-fold: it must provide structural support for the body, and allow us to move freely in three dimensions (bending over and rotating as necessary). In order to achieve this, the vertebrae in the top three sections must be allowed to move relative to one another, without compromising the structural rigidity of the back. This is achieved by the use of facet joints, which lock the vertebrae together whilst allowing for articulated movement (an articulated lorry provides a useful analogy). The joints are referred to as facet joints, because they are formed when the faces of two bones come together. Contrast this, for example, with the hip joint, which consists of a ball and socket. Facet joints are very good at allowing a broad range of movement. For example, they allow us to bend forward, backwards, and to the side; they also allow us to rotate (both to the left and to the right), and to combine these different movements. Compare this, for example, with the knee, which only allows for bending in one direction: you cannot bend it to the side, or rotate it very far. Unfortunately, facet joints can also be compressed relatively easily (where the faces slide too far towards each other). When this happens, the vertebrae in the spine can no longer move freely; in turn, this prevents us from moving freely. Put simply, we become stiff. In addition to this, we experience back pain. In actual fact, up to 98% of all back pain is either caused by, or directly linked to, compression of these joints. If you would like to understand this in more detail, please visit our section on the Back Anatomy. Patients are instructed to lie on the rack, in a central position, with their knees bent (as mentioned in the Introduction). As can be seen from the diagram, the Backrack mirrors the natural curvature of the spine. As a result, the back is fully supported: it rests in a neutral position. If you imagine a friend of yours lying on the rack, the view is taken with you looking up the rack from the bottom edge. Now, each vertebra has a number of processes, thin units of bone that extend from the main section. The transverse processes extend from either side of the vertebra: these sit on the wooden rollers. The spinous process extends to the rear (it can be seen, and felt, just below the skin in the middle of the back): this sits, suspended in the central channel. The spinous process bears no weight. The black square on the left hand side is reproduced, and then magnified, on the right hand side. The wooden rollers push up under the transverse processes. In turn, this lifts the individual vertebrae, causing them to pivot about the facet joints. As a result of this, the joints are decompressed, and the spine lengthens. Joint mobility (and soft-tissue elasticity) increases; stiffness is therefore reduced. Recall that up to 98% of all back pain is either caused by, or directly linked to, compression of the facet joints. If we can decompress these joints, something which the backrack™ does, we can treat the causes (and hence the symptoms) of back pain. In addition to this, the pressure on the joints and the intervertebral discs is lowered. This lowers the risk of spinal Osteoarthritis and Bulging or Herniated discs. Finally, the pressure on the spinal nerves is reduced; this will treat symptoms such as acute local pain, Sciatica and Pins and Needles. Full details for use of the backrack™ are contained in our Instruction Manual (PDF document).PDFs are exact copies of printed documents. To view this document, you will need Adobe’s Acrobat Reader installed on your computer. You can download this for free from Adobe’s website.